Punjab and Haryana High Court recruitment Notice for filling up the vacant positions of Clerk. Those who are looking for the stable and secure Government jobs in Chandigarh in well reputed organization can apply for this High Court recruitment process 2019. 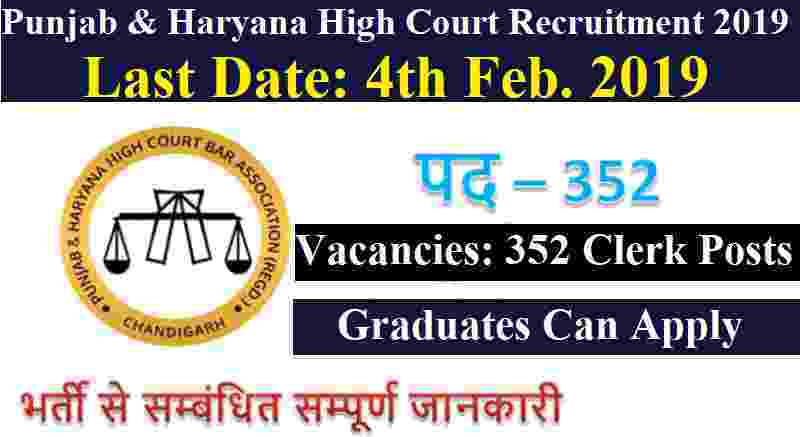 High Court of Punjab and Haryana is going to fill up total 352 vacancies of clerk job profile through this recruitment procedure. All fresher Indian Graduates are eligible to apply for these Government jobs for clerk posts in Chandigarh city. Society for Centralized Recruitment of Staff in Subordinate Courts under High Court of Punjab and Haryana (S.S.S.C.) on behalf of the District and Sessions Judges of the State of Haryana, invites online Government job requests from qualified applicants only at www.sssc.gov.in for filling up vacant posts of Clerk in the Subordinate Courts of Haryana as per details given below. We clarified full information related to these clerk jobs under this article, please read the whole article very carefully before applying online for these Government jobs in Chandigarh. Pay Band: Rs.10,300 - 34,800 + Rs.3200 GP per Month. 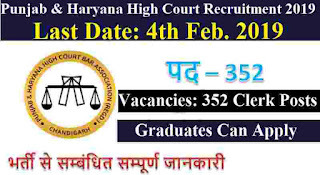 Educational Condition: Indian fresher candidates who have a Bachelor Degree in arts or in Commerce or in Science can apply for this Punjab and Haryana High Court Recruitment 2019 for clerk posts. That means applicants who have a Graduation degree in any stream can apply for these Government jobs in Chandigarh. Applicants also have good knowledge of Computer. Age Bond: Candidates age must be be in between 18 years to 42 years for applying this High Court Recruitment process 2019 for clerk posts. The online registration/filling of application forms related to this Punjab and Haryana High Court recruitment 2019 by the applicants will consist of two steps. (i) Registration Phase I: Candidate will get his/her Registration ID and password and will print ‘Cash Deposit Receipt’ for deposit of fee in the designated bank (State Bank of India). Thereafter the applicant shall deposit the requisite fee in any branch of State Bank of India after completion of Registration Step-I. (ii) Registration Phase II: After completion of Registration Step-I, the applicant shall thereafter fill the remaining particulars i.e. uploading of photograph/signature, qualification and fee payment details in the form, then to “LOCK & SUBMIT” the application form. 04th Feb. 2019 is the Last Date to apply.